Love it or hate it, Call of Duty is known for having some pretty over-the-top Collector’s Edition bundles. With the next title in the franchise, Black Ops III, Activision has apparently run out of ideas as the high-end bundle will include a refrigerator. 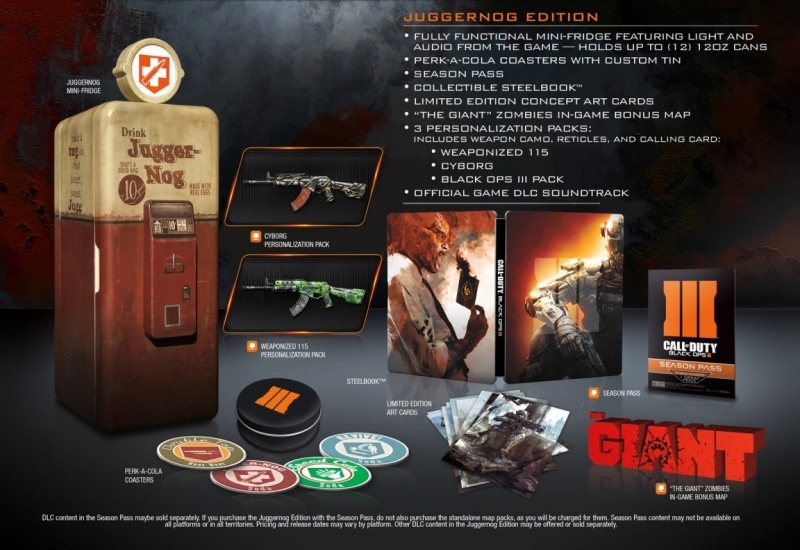 The Juggernog Collector’s Edition, as it’s being called, comes with a fully functional mini-fridge. A nod to the game’s “Zombies” mode, the Juggernog is an in-game soda dispenser that gives players a health boost (for a small fee, of course). For fans of the series, it’s actually a pretty sweet collectable. The mini-fridge features lights and audio from the game and can hold up to 12 standard-sized cans of your favorite beverage. The bundle also includes a set of drink coasters, a Black Ops III Season Pass that grants access to all four DLC packs, concept art cards, a map, a collectible steel game case, the Black Ops III soundtrack in digital format and some exclusive in-game content. Previous Collector’s Edition bundles have come with night vision goggles, an RC car and a drone. Call of Duty: Black Ops III is scheduled to launch on November 6 for PlayStation 3, PlayStation 4, Xbox 360, Xbox One and PC. No official word yet on how much the Juggernog Collector’s Edition will command although a number of retailers currently accepting pre-orders have it listed at $199.99.